When it comes to buying Christmas presents for men, I think everyone struggles a little bit. I only have three men to buy for, and they’re all equally difficult. I mentioned in this post that I feel like bath and body gifts can be a bit of a cop-out if you don’t choose the right brand; I mean, what guy over the age of 13 wants to receive a Lynx deodorant and shower gel gift set? Skincare is a different ballgame, though. The majority of men won’t buy skincare products for themselves, but they could all do with a bit of a hand in that department. Finally, after much nagging, I’ve got Colin using this Clinique Great Skin for Men Gift Set*. 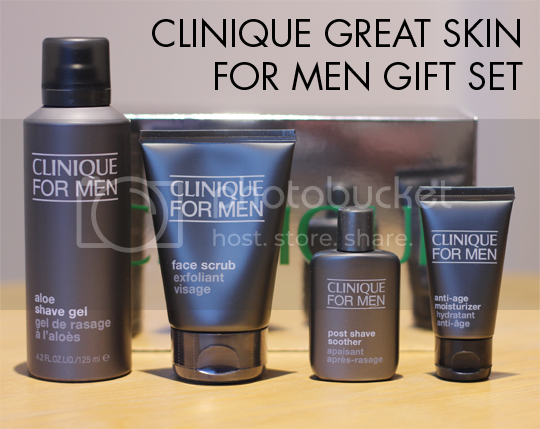 The Clinique Great Skin for Men gift set contains four products housed in a soft grey zip bag, which is the perfect size for a bloke’s toiletries when travelling (as opposed to the separate suitcase full of products we ladies require…). The products themselves live in equally sleek and understated dark grey packaging, masculine and inconspicuous enough that even the most retrosexual of men shouldn’t turn their nose up. Colin suffers with skin not dissimilar to mine – that is, underlying oiliness with surface dryness and flakes. The Face Scrub has done wonders at keeping his mug silky smooth, even if he does need reminding to use it every few days, and I’ll definitely be buying him a full size of this it runs out along with the Anti-Age Moisturiser which is a perfect complement and has been doing a great job at keeping the moisture in and the flakiness at bay. Just make sure you leave this one next to his toothbrush so he has no excuse not to use it daily! The gift set also contains Aloe Shave Gel and a Post-Shave Soother but, as a fully fledged and permanent member of the Beard Brigade, colin won’t be putting these ones to the test anytime soon. If any of the men in your life desperately need some skincare salvation this Christmas, you can pick up the Clinique Great Skin for Men gift set for £34 here from House of Fraser, who also have plenty of other men’s gift sets if you’re stuck for ideas. What do you usually buy guys for Christmas?